In what could be seen as a bit of a departure for the blog this post reflects a conversation that I had with one of the School’s PhD student cohort, Maria Lo Giudice. Maria like growing numbers of PhD candidates enjoys a multi-partner, multi-institute, and multi-country period of study in seeking her doctorate. 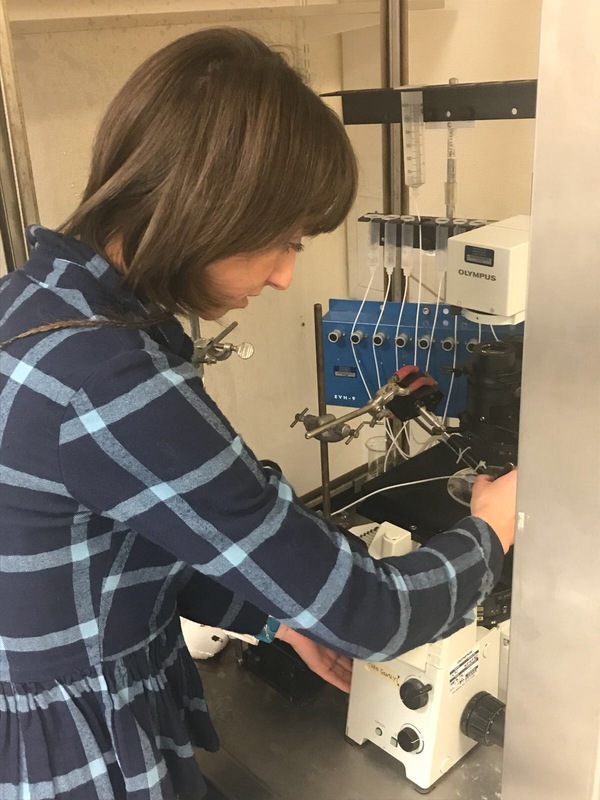 She is a visiting PhD student from Biotalentum (Hungary) working with Prof. Daniela Riccardi on a 3-month placement seconded as part of a European Training Network (ETN)) project group. I found Maria to be super enthusiastic, driven by the joy of research, and clearly determined to pursue a career that will make a difference for patients with neurodegenerative disease. She works within an open collaborative network, for an open collaborative company, employed in one sense though very much experiencing the academic research life. What follows is a transcript of the rest of our half hour conversation from back in September last year, where we explore what brought her to Cardiff, her work, and importantly the motivations underlying her career to date as well as going forwards. The text is not a particularly abridged version of our chat, which is intentional as I hope to try and convey a tiny bit of the energy and enthusiasm that Maria displayed during conversation…. Maria is originally from Palermo [Italy] and studied Biological Science there, moved to Rome to study Neurobiology because she was fascinated by the brain and neurodegenerative disease. After her master’s degree she was looking for PhD opportunities in neuroscience and similar fields. She found an opportunity at Biotalentum and so moved to Hungary, in a small city called Gödöllő (near Budapest), living in Budapest and working in Gödöllő. Me: from our opening chat it seems that you are travelling a long way around Europe in pursuing your studies, so Neuroscience must have really grabbed you? Maria: I had a course on human physiology at University during my bachelor. While studying the brain and the neurons, I remember thinking that these cells are so special because, by the way they talk each other, they let you think, act and be who you are. I think that the brain is the most amazing organ we have within our body. So I was really interested what neurodegeneration means for the brain through learning about Alzheimer’s disease, Parkinson’s disease. There are many Nervous system affecting diseases that still need to be understood and cured. So, that’s why I decided to focus on this area of research. I did my Bachelors thesis in a group focused upon Alzheimer’s research and then also during my master I worked in a lab, at the National Institute of Health in Italy, on a project regarding Neurodegeneration and again for my PhD I wanted to continue in this field. So yeah, Neuroscience literally grabbed me! Me: You have set out what sounds like a brilliantly linear plan, was that through complete intention or was there a bit of luck in coming through those phases? Maria: Both things. Of course I looked for it, but the opportunities came out during these years. While I was a master student, my professor at the University of La Sapienza told methat there was a position for a master thesis in a lab working on Neurodegenerative diseases at the National Institute of Health. So I met with the group leader and looking at my enthusiasm she was really welcoming and happy to have me in the lab. Working there, my passion for Neuroscience grow up, so after my degree I was looking for PhD opportunities aimed to study neurodegeneration through patient derived stem cells”. I sent emails to many groups around Europe that are working in this specific field and then I was happy to be accepted by Biotalentum and move to a such a cool city as Budapest! so it was definitely a mix of luck and strong determination! Me: Sounds like you had some good champions along the way, mentors or senior figures that were guiding you along the ‘right’ track? Maria: I had many people that supported me, but I think that the major driving force was my passion. I mean… I am really following what I really want! I remember one of the first immunofluorescence that I did on neurons (a technique that make the neurons coloured). I was so excited looking at the dendrites and extensions of the cells, [laughing warmly at this point and exuding enthusiasm]. Before that I had seen these pictures just on books or internet, but when you culture your cells for weeks and then you see the neurons or the astrocytes, by your eyes, then it is super amazing and you are like “WOW!! Me: you have to be patient with iPS cell work before you get the research pay offs? Maria: Yes, you start with iPSC (induced pluripotent stem cells) and then you turn them into neural precursor cells and then into neurons themselves. It’s a long process and you keep your fingers crossed [chuckles at picking up British idioms whilst here in Cardiff] that the cells don’t get contamination or that anything ‘wrong’ happen, but if you are patient enough, then it becomes amazing and each time you discover something new. It’s a step by step- process: you do the first step and discover something, then you test something else and discover more and then more and more. So, it is like if you are an author composing a story, adding something new time by time… it is exciting, and I really like it. ** At this point I regretted that I wasn’t recording better audio or moreover video to capture the look of joy and energy on Maria’s face. Me: Where are you registered as a PhD student? And where does the School of Biosciences / Daniela Riccardi fit into your work? 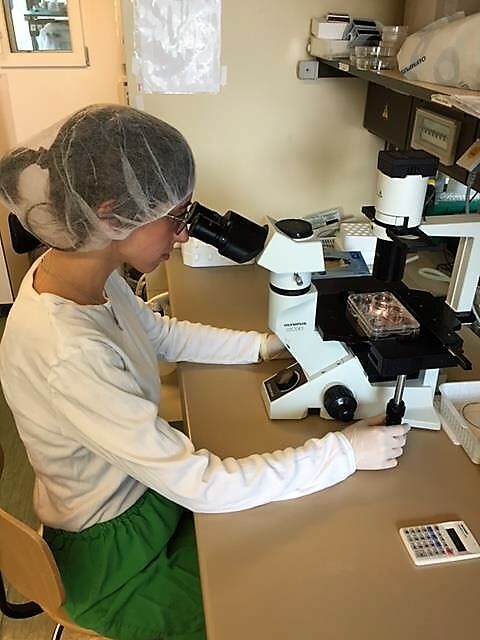 Maria: I am working at Biotalentum Ltd, which is an SME (small and medium size enterprise) and enrolled at Szent Istvan University of Gödöllő as PhD student in frame of the CaSR Biomedicine European Training Network (ETN). This project is a Marie Skłodowska-Curie Action, where 13 European partner Institutions (comprising both Universities and SMEs) forming a consortium, with 14 ESRs (PhD students) working on a specific project regarding the Calcium sensing receptor (CaSR). Me: So, you are a team, not just 13 placements you are working on a common goal? Maria: Yes, we are working on different projects and scientific areas, which are all aimed to investigate the CaSR. So, my work is focused on the role of the receptor in Alzheimer’s disease, while other ESRs are studying the CaSR in other fields such as asthma (Daniella’s ESR), cancer, diabetes and so on. The wonderful thing is that we are all collaborating, so we can share ideas, problems, findings. Me: A collaborative group bringing different things is around the focal point of calcium receptor signalling? Maria: Exactly. We have annual meetings where we are presenting our data, discussing results, difficulties and next steps… so we are really collaborating with each other. I know that it could sound unusual because in the wider scientific world there is a lot of competition, and most of the times, people don’t share data and they try to keep them secret until published. But, fortunately, this doesn’t happen within our consortium. Both PIs and ESRs are always open to discussion and suggestions. I think on a way that my success could be also a success for my colleagues (same on the contrary), because if I find something new, it might be helpful also for other people’s work… that’s the way how science goes on, no? Me: Each successive bit of knowledge brings more research, and with 13 spokes on the wheel I guess that could go in any number of directions? Maria: Yeah It is a big multidisciplinary project and all together we could potentially get many interesting new findings and the PI’s help and guide are highly important. What I like is that there are no barriers between PhD students and PIs … If I have a problem, a doubt or I need to discuss an experiment, I can easily reach my supervisor or the PIs from the other Institutions, as Daniela here in Cardiff (who is not my PI). I need just knocking on the door going in and sitting down. They are always there to support you and for having a brainstorming! Me: this sounds like is a really good grounding and training for your future career, as an early stage researcher. Learning those skills of just knocking doors and asking and opening up and talking about your work to people. This scheme sounds like a very open experience that creates the mindset for future work in science and elsewhere. Maria: It sounded good already before starting. After a while I realized that it is even better than what I had imagined! Me: okay, you are based in Hungary but you are here with us, so where does the Cardiff PhD student fit? Is there a pre-condition that if you are taken on by one partner that you must visit another one? Maria: I am employed at Biotalentum. But during the PhD, I have the possibility to visit other partner Institutes for secondments. It is especially helpful to develop the project, to perform particular experiments that are not possible to be done in your home-Institute. That is why I am here, and it works at the same way for all the ESRs. Me: So nice and mobile then if you can just look at that institution and talk to that PI or that team and say hey can we go there? Maria: Yeah, exactly. It’s so easy and it is great because you can see different ‘realities’, different ‘ways to work’. You can learn new techniques and enrich your skills and knowledges. Me: You came from one European capital city, Rome, to another slightly smaller capital city, Cardiff, so I am intrigued as to how you found that? Maria: In general I prefer living in big and crowded cities. But, even if smaller, I found Cardiff enjoyable and stimulating! It’s really easy to go out, there are a lot of pubs all around the city. I felt like at home. And the weather has been surprisingly good – I expected to use my umbrella everyday… but it did not happen! I really like it. It is a nice city especially for students. Cardiff University is very welcoming and offering a lot of social activities. It is placed in the city center, that makes hanging out with Lab’s colleagues even easier. I also like being in an international group – in Daniela’s lab, there are colleagues from China, Mexico, Africa so it is nice you can meet people from all over the world. Me: That is wonderful to hear, again some PhDs can find the experience of their study a little claustrophobic, they are in the lab and they are working a bit too much, and some don’t experience the location they are in as much. Maria: Ha-ha, it might be that I am one of those PhD students! I am often in the lab during the weekend. The fact is that I’m working here for a limited period of time, so I want to do as much as possible, but even if it’s 7 or 8 o’clock, the University is in the city center so I am still on time to meet with my friends and having a beer! Then, I know that there are many beautiful places around Cardiff, for example I went to Swansea and I found it was amazing! So if you have time, there are a lot of things to do and places to see! Me: How long is your placement here? Maria: 3 months, I started in mid-September and I am leaving in mid- December. The secondment’s timing is flexible, it can be for few weeks or even several months, depending on your planned experiments. Of course, it has to make sense for developing your project. Me: Could you tell me a bit more about Biotalentum? Maria: It is [based in Hungary] a small to medium enterprise (an SME) working on many different-iPSC based projects. There are PhD students, postdocs, research assistants working there. At the same time, because I am a PhD student, I am also enrolled at the Szent Istvan University to get an accredited degree. So, I am enrolled at the University and I am working at Biotalentum. 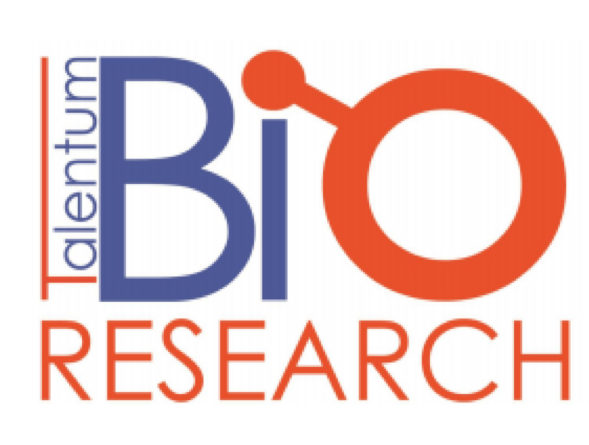 Me: Biotalentum – how does Alzheimer’s / neurodegeneration research tie in with them? Where did Biotalentum fit in your plan? Maria: So Biotalentum is a small company and its expertise is especially on stem cells. The company’s mission is research and development of novel human cellular systems for biomedical research and drug testing, and to provide technical services for research teams and the pharmaceutical industry. In particular, Biotalentum is developing human pluripotent stem cells (iPSC) to produce different cell lineages (as for example neuronal cells, cardiac cells..) for disease’s modeling and drug screening. In my project, I am studying iPSC-neurons derived from Alzheimer’s disease patient. Me: What does the team look like? Maria: it is a diverse team with postdocs, lab technicians, administrative office members, and so on. There are several PhD students, (a new PhD student from France has just started this year). 2 more students got their PhD this year, one was from India one from Poland, so it’s an international environment as well. All together, the staff counts around 20-25 people, so you can easily get in touch with all of them. Me: So exactly like the European Network it is that same open environment that you can knock on a door and ask what you need? Maria: Yes, I feel the same support as within the ETN. So, it is combining the advantages of a University, regarding the learning- studying process, with the possibility to see how a company works. Somehow, I can live the same experience, in two different ways, as a student and as an employee. Me: What do Biotalentum PhD students do, do they become biotalentum postdocs or do they go off to other places? Maria: It depends. As far as I know, Biotalentum often offers to the PhD to stay at the company even after your degree. But it depends on the cases and on the people’s will. Me: This is possibly an unfair question to ask a student in the middle of their PhD but I have to ask because it seems like you have a very clear minded direction through your work, from your degree, masters, and so on… working within Biotalentum and the ETN as you have been is that helping form the idea of where you are going to go next? Maria: Wow, that’s a really hard question… so what I know is what I want to do, I want to keep doing this kind of research… is not clear on my face?! [it really was]… I really think I will go wherever there will be an opportunity to do it. Maria: I started to be interested in neuroscience a long time ago…as I said.. I was passionate and fascinated by the brain in general, I was excited by how wonderfully it acts…then I knew people with neurodegenerative disorders, these are such terrible and hard diseases to live with. I saw the other side of the medal… and I started to think not only to -“how amazing the brain is when it works”, but mostly to “why and how it stops working” and this has been an even stronger driving force. Me: So, it was this other context that drove your purpose even more, it is nice to hear that that kind of clear mindedness. It’s great to hear that innate inquisitiveness. I think that will serve you well in the future. Maria: You know, I am working with iPSC-derived neurons from Alzheimer’s patients and healthy people. One of the first aims of the project was to evaluate if the diseased-derived neurons were really “diseased” and for this purpose we measured the level of the toxic amyloid protein which is pathologically overproduced during the disease. Finding that the patient-derived neurons were really secreting more toxic protein than the healthy ones was exciting and shocking at the same time! Reading these things on papers and books is really different than when you are looking at them by yourself… sometimes I try to stop the enthusiasms, thinking ok.. these are cells on a plastic dish, it is not a real brain, but then I cannot stop thinking that, despite the limitations of the technology, we are able to catch a tiny bit of what happens during the disease. And then you are more motivated and you want to keep on and trying to understand why it is happening or how you can stop it. Me: So, there is that excitement of having a model that genuinely represents the phenomena that you want to explore? Maria: Yeah it is really exciting. Me: thank you so much for your time. I could drill into all sorts of technical bits and bobs – “how is that working?”, “How are you doing that?”, “What are using?”, but I don’t want to keep you all day. I am glad to hear that you enjoy Cardiff and hope that when you go further afield that Cardiff will go with you. Featured image built using Canva – design tools, with the background image within the feature image provided by Maria Lo Giudice.